As a third generation Eigenbrodt GmbH & Co. KG, with a team of qualified co-workers, incorporates the flexibility and the "know how" also to provide solutions for requirements going beyond regular measurement applications. 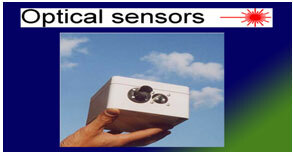 With special consideration to the climatic extremes of the customers measurement site. Main focus is to be found in development in close cooperation with Universities, Scientific Institutions, Weather Services and Environmental Departments, followed by production itself and the marketing of meteorological instruments and environmental measurement products. Our sensors and instruments are working in many national- and international measurement networks such as German Weather Service, Alfred-Wegener-Institute, Met Office, EMEP, GAW, GMOS. Cooperation’s with partner companies worldwide, in many countries offer a customer-friendly service to our users. 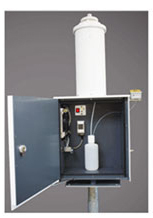 The precipitation sampler is used for the purpose of collecting the precipitation into a large single sample bottle. The individual sample bottle can be easily removed from the apparatus at the end of the period of measurement for laboratory analysis. Every single component which is used for measurement is made out of chemically neutral material and placed in a thermally insulated housing. At high temperatures the housing is cooled automatically (optional) to avoid overheating from intense radiation of the sun. For winter operation an electronically controlled funnel heating and a heating for the sample room are provided. Ideal contact materials for organic and mercury content collection. Various configurations choices allowing very good adaptation to different collection applications. 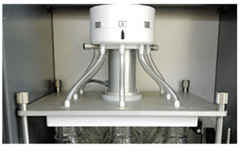 Collection of precipitation for analysing organic components as well a mercury in the precipitation, the choice of the best fitting contact material like sample bottles and funnels is very important. In this cases PTFE and DURAN-glass are preferable to HD-polyethylene. For all types of instruments funnels and sample bottles are available in DURAN-glass. The separating system components for type “D”, “T” and “S” are made out of PTFE. ONES 250 (OFS) is a sensor for visibility with a good cost-performance ration with a main application in traffic purposes. Using so called backscatter technique it measures the amount of water particles i.e. fog in the air that limit the visibility. The design allows the operation in various locations and applications. The validity and the stability has been - so far - resulting in satisfied customers. Pollution Equipments & Controls was formed by group of professionals dedicated to cause of environment in the year 1986 with a view to provide the latest technological Equipment in the field of Meteorology, Hydrology, Air & Noise Pollution Monitoring Instruments to our users. © Copyright 2005 PEC-India. All Rights Reserved.